Summer is here, and summer brings its own safety risks both outdoors or in the community. Perhaps you fear your child may run away from you at the park or is unaware of cars or the steps to safely crossing a street. During therapy your child can learn community and home safety skills. Here are some summer safety activities you can teach your child. Please speak with your clinician if you are interested in teaching any of these safety skills, we are here to help with this process! You can teach your child to walk next to you without needing to hold their hand, just practice in baby steps. Start by practicing this skill in your living room. 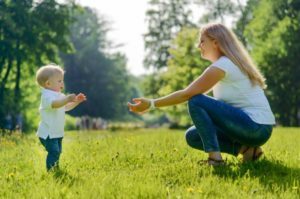 Take your child by the hand and give the instruction of your choosing, such as “walk with me.” To avoid confusion, it is important to pick a phrase that your whole family will consistently use. Walk a short, 3-foot distance, each time you say that instruction. As soon as you’ve walked that 3 feet provide your child with some tickles or a small piece of their favorite food, like an animal cracker. You can practice this short distance a couple of times, back to back. The more you practice the quicker the skill will emerge! Try this skill for a couple days until you notice your child is less resistant to holding your hand and following your lead. Then you can practice without holding hands. Eventually, with success, you can lengthen the distance walked together from 3 feet to 5, 10, and more. Work on having your child stay next to you during walks, at the store, and on community trips. You can teach your child to safely cross streets by breaking down the steps. Practice this skill when you are on a leisure walk with no rush or final destination. This will ensure that you can turn around and head back home with any instance of challenging behaviors. First Say, “Stop” when you approach curbs and point to the street. Then stand behind your child so he can’t run into street. Give the instruction “Look both ways.” (If your child understands Left and Right you can alter the instruction to be “look left, look right, any cars?”). 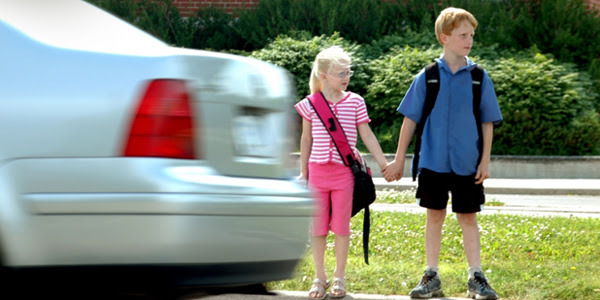 It is important to point out nearby moving cars and ask your child “Are there cars moving?” (using the word moving cars will avoid confusion about parked cars or the meaning of other words such as cars coming). It is ideal to practice on roads where you will see moving cars so your child learns to actually look for moving cars rather than just turn his head side to side. When you see a moving car, “We have to wait for them to go by.” When there aren’t cars moving, “There are no cars moving; we can cross the street now.” Additionally, with success, practice this skill with you saying less words (e.g. “S…” instead of “stop” at the curb). 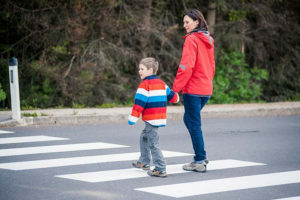 Once your child is going through these motions with minimal instruction from you then you should practice with a variety of streets and parking lots (e.g., grocery store) and discuss with your child that he must always cross a street with an adult even if something happens, such as his ball rolls into the street. You can teach your child to wait near you in community settings by breaking the skill down and practicing it in your home before you practice in the community. Two aspects of this drill will gradually increase with success A) the amount of time your child waits and B) the distance you move away from your child while they wait. I recommend starting with a waiting time that your child will be successful with, perhaps 5 seconds. Similarly, with success you can increase the distance you move away from your child, perhaps starting with one step away and gradually increasing the number of steps. Is your child a visual learner? Add some additional supports such as a small towel or placemat for them to stay on while they wait. Additionally, if your child has a small toy or fidget they enjoy this can be their designated “waiting toy.” When they see this toy they will remember what is expected while they hold it they have to stand in one spot. Praise and reward them for waiting in that spot for the designated time.